• Diamond anvils and diamond anvil cells for optical spectroscopies, x-ray, magnetic and transport measurements at pressures up to above 100 GPa. • Piston-cylinder clamp cells for magnetic and transport studies at pressures up to 3 GPa. • Electro-discharge machine (spark eroder) for sample space preparation in diamond anvil cells. • Optical equipment for pressure measurements based on ruby fluorescence. • Specialised innovative diamond anvils (such as Boehler-Almax anvils) and windows. • Cryostats with integrated diamond anvil cell for turn-key high pressure experiments at low temperatures. • Spares and accessories for high pressure research, including our ecommerce website: www.diamondANVILS.com. January 2017: Now available from Almax easyLab: type IIas diamond anvils, for infrared and/or very demanding Raman spectroscopy. September 2016: The Optiprexx High Pressure Manager is here. Control and calibrate the pressure in a gas membrane DAC at the touch of a button. April 2016: Patterned diamond anvils are now available from Almax easyLab. 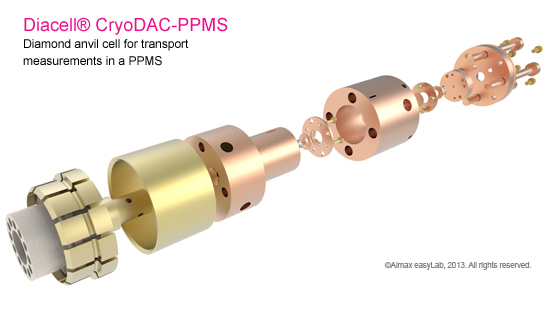 We are delighted to offer diamond anvils with deposited gold patterns for electrical transport measurements in a DAC. March 2016: The next generation of diamond anvil cells is here: Diacell® ChicagoDAC - an efficient and compact bellows-driven diamond anvil cell for high-pressure, low-temperature transport measurements.